"HOWL FOR THE CAUSE TO SAVE OUR WOLVES"
"Give Paws A Chance Rescue" sponsored by "Running With The Wolves, Inc,"
a Long Island based 501 (c) 3 Non-For-Profit Organization. help feed & care for captive "Wolves" & "Wolfdogs" in the USA. Standard shipping is included in your adoption. 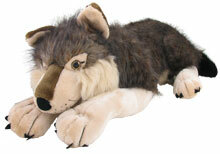 Please allow 3-4 weeks for delivery, Plush Wolves may vary from picture showed. Warning Hazard: Plush Wolves contain small parts, not for children under 2 years old. Please Donate now to Help Feed, Care & Protect our "Wolves". Your donation also helps with our Wolf Awareness & Educational programs throughout the year. Choose our Adopt-A-Wolf Program below. Please have your name, address & phone number on your check. If you are sending a check for our Adopt-A-Wolf Program please state what you are donating for - a Wolf Pup, Papa Wolf, Mama Wolf & Pup or Grandfather Wolf. Receive Lone Pup Wolf 10"
WOLF FACTS: The "Wolf" mates for life & lives in a pack of family members & relatives. & barks help keep the pack together. 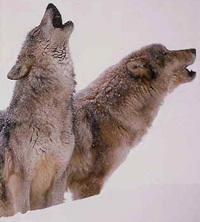 A lone "Wolf" will give a BEAUTIFUL"
& "HAUNTING" howl when separated from the pack.